Visayan warty pigs are currently extinct on all but two small islands in the Philippines. These small, forest pigs are named for the islands where they are found, and for the three pairs of fleshy “warts” on the male pig’s face. Biologists think the warts help protect the face when fighting. They eat a variety of forest fruits, roots, and tubers, but sometimes emerge from the forest to raid cultivated grain and vegetable plots. These pigs live in rainforests in the Visayan Islands in central Philippines. Extinct in 98% of their range, they now live in patches of remaining habitat on the islands of Negros and Panay. Only recognized as a species in 1993, very little is known about these wild pigs. Males grow long spiky mohawk-like manes during mating season. Biologists think that the three pairs of fleshy warts on their faces may protect them from tusks of rival pigs during fights. 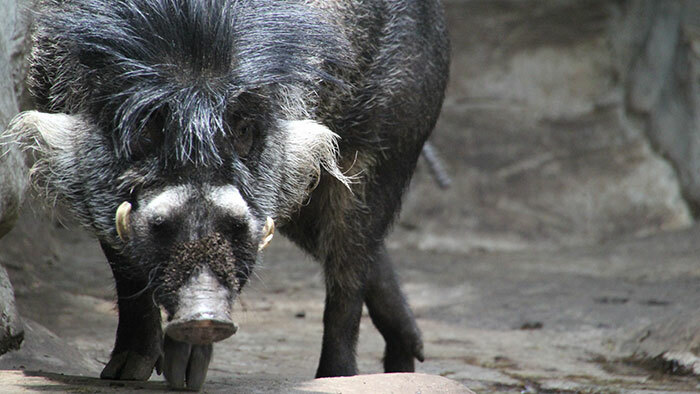 Visayan warty pigs are critically endangered. Major threats include habitat loss, hunting and interbreeding with domestic pigs. Considered pests locally for raiding crops, internationally they serve as a flagship species to preserve the Philippine biodiversity hotspot. Adult Visayans have long hair on the tops of their heads and spines. When threatened, they raise their spiky manes to make themselves appear larger and more menacing. Preventing habitat loss is especially critical for the future of this species. Life can be difficult for animals confined to islands because they cannot leave to escape predators or hunters, or to look for food. 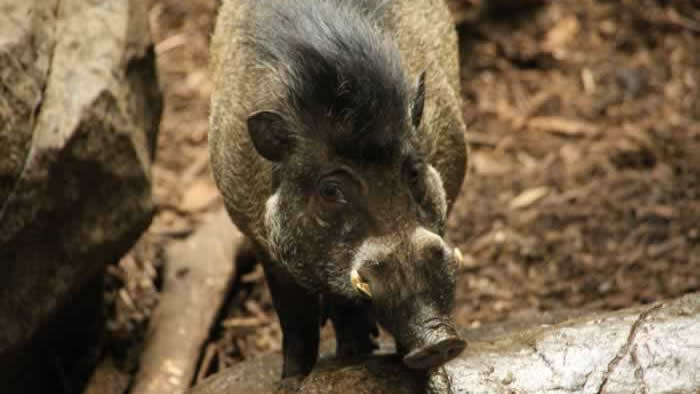 The Minnesota Zoo has become the 5th zoo in the nation to join in recovery efforts for the Visayan warty pig. By implementing an emergency breeding program and encouraging and facilitating local conservation in the Philippines for this species and others who share its forest habitat, we are working to ensure the survival of this critically endangered animal.